Like many Americans of her generation, she grew up with a kitchen garden, and a major family activity was preserving the summer’s bounty to liven up their diet during the winter. 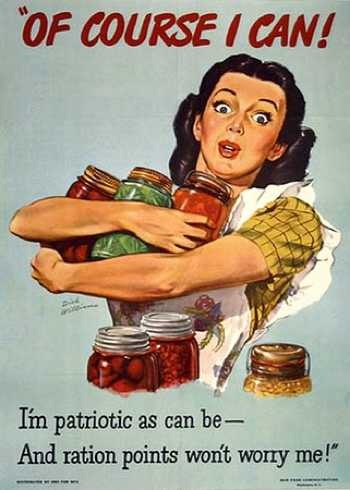 For many people today, canning food is an enjoyable activity and allows them to “eat locally” all winter long. Many people are joining CSAs (community supported agriculture), buying memberships that allow them weekly “shares” of a local farms produce, and preserving some of that food. Sounds good, right? But a national survey found that many people who process food at home are doing it in a way that puts them at risk for spoiled food and foodborne illness. What’s an avid canner to do? In steps the National Center for Home Food Processing and Preservation! This wonderful site, supported by the national Cooperative Extension system, has plenty of evidence-based advice for anyone interested in canning food that is delicious – and safe. Click on the links for more information. The last item is one that we have many arguments about in my household, with me wanting to throw out anything more than a week old. Who knew that you could keep an open box of cereal for 2-3 months? There’s also a multi-media page, with videos of important home food preservation issues and slide shows, too. A tutorial about safe food preservation is a must for the novice, and it is really what this site is all about: preserving delicious food and using the latest scientific evidence to do it safely. I love your grandmother’s quote! I’ve been getting more into fermenting lately, but I love canning. I have a pressure canner, but I’m always jealous of those bolt down lid ones that I see lots of people have. I guess as long as we’re making safe food, that’s really what matters. I appreciate all of the resources you provided here. I’ve heard of the extensions before but never really knew what they offered. I look forward to learning more from them as I’d love to add even more variety to my pantry. Thanks again for sharing. I have been looking for help in learning to can. I did a “workshop” over the summer on water bath canning but I am really interested in pressure canning. And just like you mention in the article, I don’t want foodborne illness affecting my food after all my hard work. I have been in touch with CCE to see if there are any canning classes to take. I keep checking their website and calendar but haven’t seen any as of yet. Would you know of any? I’m afraid to try it on my own and know of no one who cans so it seems like right now I’m stuck! Thanks for any info.